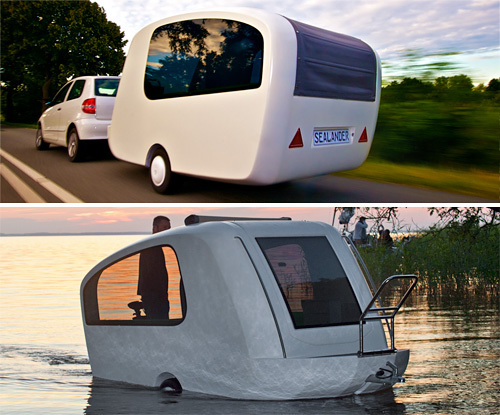 Sealander Amphibious Camping Trailer | OhGizmo! Can’t decide between a weekend getaway spent at a relaxing campsite or cruising around a lake? Now you don’t have to! Or at least, you no longer have to bring both a canoe and a camping trailer since the Sealander, created by industrial designer Daniel Straub, actually floats on water. Its wide, bowl-shaped design not only provides stability while floating, but it can easily navigate shallow waters without running aground. It also means you don’t need a trailer or a boat launch to get it in the water. Backing it up to a sufficiently cleared shoreline should be more than enough. 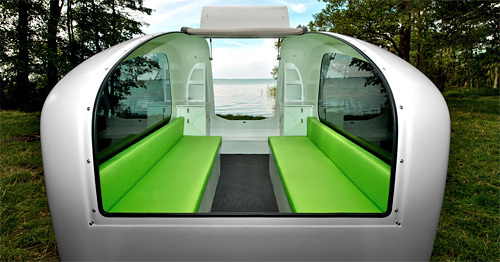 The inside of the rather compact, but light, trailer is designed to be completely modular, allowing it to be configured for cooking, cleaning, eating, sleeping and even on-the-water activities like swimming or fishing. A small electric outboard motor provides the propulsion while out on the water, while the trailer’s double sealed air chambers on the bottom ensure you’ll never have a miniature Titanic on your hands. Available sometime in 2012, in various designs and configurations, starting around $20,400 (€15,000). It’s only a matter of time before Top Gear try to make their own, then sink in an amusing fashion.